"Cover your eyes," said literary agent Katharine Sands, addressing a crowd of 60 or so in a crystal-chandeliered ballroom of the DoubleTree by Hilton Hotel Burlington last Saturday. When you try to sell a story you've written, she explained to the audience, you are facing "a void, a black hole. And you're going to fill it with something. ... The first thing to understand is that you must bring something to life." The audience listened closely, with reason. Many of them had come to this event — a program of the League of Vermont Writers called Writers Meet Agents — to pitch their own novels, memoirs or nonfiction works to the pros. In a room down the corridor, a rotating crew of eight literary agents from New York and elsewhere were already holding 10-minute individual pitch sessions — a sort of speed dating for authors. At $25 per pitch (plus a $125 to $155 conference registration fee), the sessions were sold out. Conferences geared to writers seeking publication are common in metropolitan areas, but Writers Meet Agents is the only event of its kind in Vermont. The famous Bread Loaf Writers' Conference, soon to begin another August session in Ripton, is residential and requires an application process. The nonprofit, volunteer-run LVW counts about 200 members in Vermont and environs, welcoming "all who have a passion for the written word and writers at all stages of their careers," wrote board president Alyssa Berthiaume in an email. The organization dates back to 1929; early speakers at its events included Robert Frost. Today, the LVW runs quarterly workshops and other programs around the state each year, but its most popular is the biennial Writers Meet Agents, introduced in 2010 and open to both members and nonmembers. 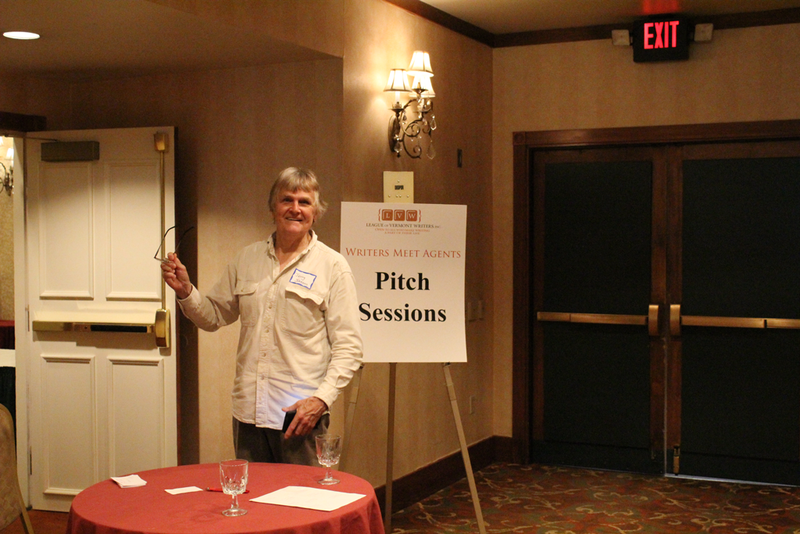 Of this year's 95 attendees, about half were pitching, said member-volunteer Shawn Anderson. In addition to the pitch sessions, the daylong conference had a full schedule of roundtables and presentations by agents, authors and one local publisher — Dede Cummings of Brattleboro's Green Writers Press. While a sizeable contingent of the writers looked to be of retirement age, younger faces were present, too — and a few very young ones. A 12-year-old Montpelier girl had run a successful GoFundMe campaign to attend: Her page was headlined "Help my writing dream come true." Among those waiting for their pitch sessions was Stephen Russell Payne, a surgeon and longtime University of Vermont College of Medicine prof with a passion for fiction. Having had some success with his self-published novel Cliff Walking, he came to pitch the sequel and a story collection. When Sands was done elucidating the art of "pitchcraft," Janet Reid took the stage. The agent at FinePrint Literary Management has made a name for herself as a tough-love guru for writers, dissecting poorly written query letters with dry wit on her blog Query Shark. Each week, Reid told the audience, she receives about 500 queries from authors seeking representation. The query helps an agent determine that "you are not, as we say in New York, an asshat," she averred. Writers can earn themselves an instant rejection from Reid with phrases such as "fiction novel" (all novels are fiction) and "sure-fire bestseller" (show your book's potential, don't tell). When it comes to format, Reid declared, "You can break all the rules, but you have to do so in a way that is utterly compelling." For her part, local novelist M. Larose (who asked to be identified only by her pen name) said she prefers live pitches to emailed queries: "In-person connection is important to me." This conference was her fourth pitching experience, and she "felt much more relaxed," she said. Agents who like pitches may ask for written material from the author. In an email, Berthiaume recalled her own pitching experience, two years ago: "I totally screwed up my pitch. I waffled. Or so I thought." The agent ended up asking to see more of her work and "provided me incredible feedback that definitely shaped those two book projects for the better, as well as [ones] that I've written since," she wrote. Anecdotal evidence suggests that a tiny percentage of pitches (or queries) lead directly to an offer of representation. But when it happens, noted published novelist Jan Gangsei in her talk, it's worth it: "I'll let you all know, if you get that call, you'll lose your minds." Payne wasn't about to give up. Returning from his pitch sessions, he reported that Reid had declared herself too hard-hearted for his book — which explores the aftermath of domestic abuse — and sent him to a different agent. Two agents ended up asking to see his manuscript. Larose had a request for material, too. She'd decided to "just have fun" with her pitch. Conferences like this one had made her more confident about approaching publishing pros, she explained: "It's like any job interview. I'm a lot less anxious after having realized this."